I decided to revamp the web-version of the LPC Sprite Generator that was made by Gaurav0. Boom Shaka has informed me on missing sprite from the originial LPC Generator and I'll be adding them to this version. Also if any artists would like their assets implemented shoot me a message on here and I'll add them. - Updated layout so it looks better on lower-resolution monitors. Guarav0 - For the original Universal LPC Generator to Web Conversion (link). Jrconway3 - For the original Universal LPC Generator (offline/gimp version) (link). Makrohn - For the original Universal LPC Generator (link). Various artists - For their awesome LPC Works. (All authours should be in the AUTHORS.txt on the actual hosted version)(link). 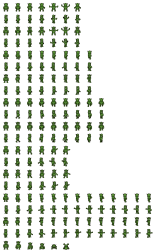 "View Spritesheet" button works now thanks. I'm on Windows 10 and I tested it using Google Chrome and Mozilla Firefox -- looks and runs great. Thanks for doing this by the way. LPC may be older but some of those assets were added as late as March, 2016 so it's obviously still in use. I love LPC, I am in the process of learning how to make a game (using unity) and found the other Generator and thought I might make a personal touch. Looking at making this look like the normal character creator so expect an update in the near future (when I get time inbetween uni assignments). I also have some VERY basic recolors of the long-sleeve shirt, pants, and tabard/jacket for men. Nothing special, just adjusted hue/saturation to get some more variety. 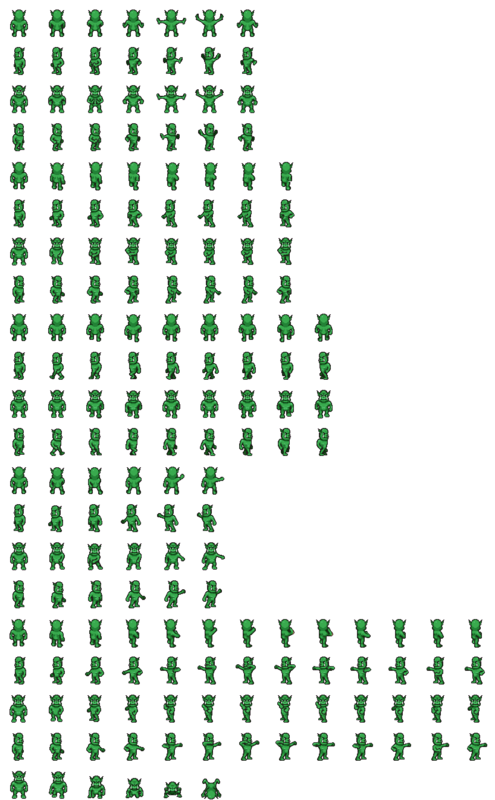 They're formatted to fit the sprite generator output (including oversized animations). Interested? If so, I'll add them as resources and put them into the "missing assets" collection. Pretty sure all are licensed for derivatives but I can pull any that aren't. PS -- I see you already put the glow-swords up....nice! Yeah, feel free to do so, I'll add them either in the morning (currently 3:46AM bout to sleep) or later on in the day. Oh, ha! ha! No rush at all. I still need to go through and make sure original artists are properly cited and was thinking about adding a few more colors as well. Probably will be a day or two at least. Nice i bookmarked your link. Anyone else notice that you cant choose the half messy hairstyle on either this or the original generator? Jon, Which is half messy I can only see Messy1 and Messy2? Thanks for revamping the character generator! It looks really nice. I'm glad people are still using it. I need to point out that the generator is licensed under GPL3, and as such, your new layout must be distributed under that license. Please clarify your copyright notice at the bottom of the site. Okay no worries, I removed my Copyright notice and updated the license link. Couple different colors but im 99.9% sure this isnt used in the generator(unless im dumb). Oh sorry for the late reply i dont get much time to use the pc, also it works perfectly on firefox on windows 7 incase you wanted to know xD. Noticed one thing: the shoes appear to be stacking on top of pants and robe bottom. They should probably be in one of the bottom 2 or 3 layers. Everything else looks great. Well done. Its nice that someone got around to updating this. I wrote a PHP version a while back that took a JSON file and listed off everything, but then I realized PHP might not be supported on the hosting (and I didn't plan to create a new host, I was just trying to find a way to make it easier to update Guarav's), so I stopped working on that one and never got back to it. I'll try it out later. And maybe, just maybe, I'll be able to make progress on my own projects again soon... so I might be able to contribute. But I can't guarantee anything. Nice to see that I got a credit, but I didn't do much, I just updated it a bit to help Makrohn. I think it would be nice if you removed the standing frames from the walk cycle display, or made them last a little longer.. Having it flash in there looks a bit glitchy..
Hi Guys, for some reason I cannot login to my original account, so I made this one. Currently in final weeks of semester for uni and my grandfather just passed away, so updates are halted until I have the time. Another note: I tried to use the forgot password but it errors with one line on the page saying soemthing like error in connection socket. Thanks, for the support guys. I've recovered my original account, which is good. I now have the time to update the generator, so look forward to that in the next few days.